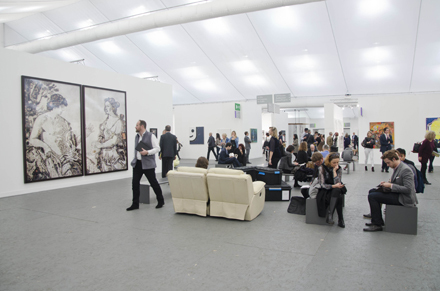 Frieze London has announced its “Projects” section for the 2014 edition of the fair in Regent’s Park. Curated by Nicola Lees, the seven projects located both on-site and around London will include a “living stage” by Nick Mauss, where ballets will be performed each day, and a secret map of the fair routes by Sophia Al Maria, underlining conspiracies hidden throughout. The presentations will also feature a reconstructed musical performance from the career of conceptual comedian Andy Kaufman, enacted by Jonathan Berger. This entry was posted on Saturday, June 14th, 2014 at 4:00 pm	and is filed under Art News. You can follow any responses to this entry through the RSS 2.0 feed. You can leave a response, or trackback from your own site.